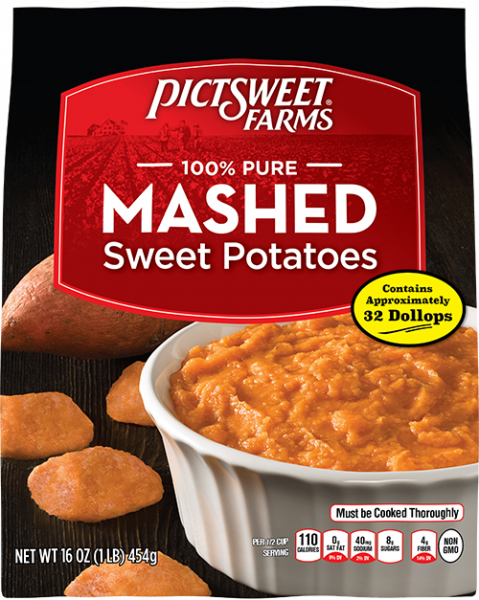 ​Mashed Sweet Potatoes are perfect as a side dish. The individual dollops are ideal to add to your favorite foods like pancakes, muffins, burritos or as a base for soup. No preparation needed; just heat and enjoy! PLACE frozen dollops and 1/4 cup water in a saucepan. STIR constantly over medium heat for 10 to 11 minutes. 1/2 PACKAGE: Use 2 Tablespoons water and cook 5 to 6 minutes. PLACE frozen dollops in a microwave safe dish and cover. STIR and microwave an additional 2 minutes. 1/2 PACKAGE: Cook 4 minutes, stir and cook an additional 1 minute.